Michael Reeves’ classic sci-fi horror sees man-about-swinging-London Ian Ogilvy become sweet old couple Boris Karloff and Catherine Lacey’s psycho puppet. The discotheques, dolly birds and double deckers of 1960s London have become some of British cinema’s most easily lampooned clichés (see the Austin Powers films if you need proof). In the heady few years mid-decade when England’s capital was the most exciting Place in the world it quickly became the most obvious place to set a film in the world. Swinging London became a convenient backdrop for various genres: art cinema (Blowup), comedy (Smashing Time), crime caper (Kaleidoscope) and spy drama (Arabesque). In this short series I’m going to be revisiting a small but fascinating series of 60s and 70s horror films set in contemporary London that give us a glimpse of a darker, sleazier side to the Swinging City. Less swinging, more (to use a not very 60s word) minging. Let’s start off with a look at the second (and penultimate) film directed by tragic boy wonder Michael Reeves. It’s not unusual for a marriage to disintegrate from loving companionship into bitter battle of wills, but in The Sorcerers it happens both more quickly and more literally than usual. The film revolves around a trio of characters, linked in an ingenious way: Marcus and Estelle Monserrat are an elderly couple living a meagre existence in a dingy flat that seems a world away from the nightspots haunted by handsome swinging Londoner Mike (Reeves’ regular hero Ian Ogilvy) – although the film’s low budget means the nightclub setting seems scarcely less grotty than the Monserrats’ home. 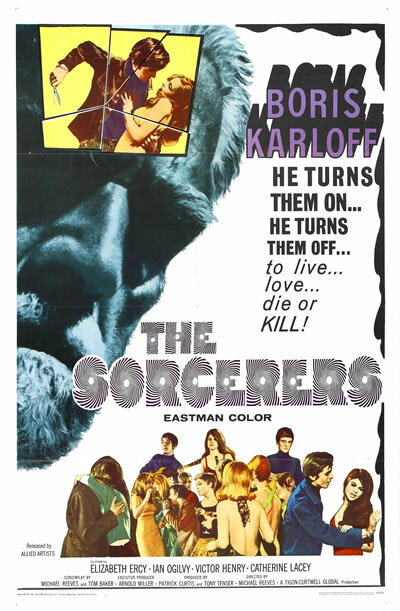 Marcus (a perfectly shabby, weary-looking Boris Karloff, seeming nothing like a Hollywood star on a visit home) is a medical hypnotist whose claims of his lasting fame are belied by his need to advertise in a poky local newsagent’s. Estelle (Catherine Lacey) is a loving companion who has patiently gone without as Marcus spent a fortune on building a bizarre machine in their spare room. Marcus’ quest for a subject to try his mysterious apparatus out on brings him into contact with jaded, thrill seeking Mike. Their late night meeting in a Wimpy bar (one of a series of joyous period bits, including a stack of Nova magazines and Cliff Richard’s “In the Country” on the radio) seems like an uneasy pick-up – “I could offer you an unusual evening,” Marcus promises, “some extraordinary experiences” – but Mike’s game enough to go along with it. extremely young Susan George). There’s an uneasy message in all this to us, the audience, sat here experiencing all this violence on screen with no threat to ourselves. Having been denied pleasure for so many years, Estelle’s impulses easily override Marcus’s more benign ones, and he helplessly finds her gaining complete control of Mike. Catherine Lacey’s performance is just incredible: her transformation from meek housewife to blood-crazed harpy is horribly convincing (the highlight perhaps being her queasily post-coital sigh of “that was the best yet” after she forces Mike to beat up Alan). And for me at least poor, good-natured, bewildered Marcus is one of the finest performances of Karloff’s career. It’s a real achievement of Reeves and his actors that The Sorcerers’ most compelling scenes consist of two old people talking. Ivan Kirby lives in Brighton and has been fascinated with horror since his childhood encounter with the Fighting Fantasy gamebook House of Hell. He’s also indecently obsessed with all manner of peculiar things from the 60s and 70s, despite not actually being alive then. You can read more of his barely coherent thoughts on such things here: http://jumblesalefrenzy.wordpress.com/.